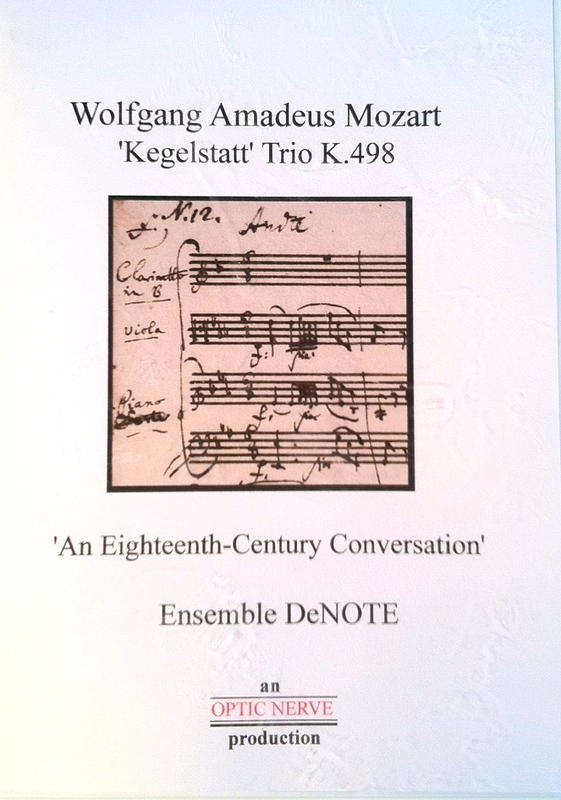 MOZART’S KEGELSTATT TRIO: AN EIGHTEENTH CENTURY CONVERSATION. Ensemble DeNOTE recorded a video documentary of Mozart’s “Kegelstatt” Trio for clarinet, viola and fortepiano at Finchcocks Musical Instrument Museum at Goudhurst in Kent in May 2012. The DVD, Wolfgang Amadeus Mozart “Kegelstatt” Trio K.498: An Eighteenth-Century Conversation, is produced by Optic Nerve Films. It contains a 20-minute documentary on the work, covering issues of performance practice, interviews with the players and a ‘behind-the-scenes’ insight into the rehearsal process; introductions to the period instruments; and a complete performance of the “Kegelstatt”. The “Kegelstatt” was Mozart’s only composition for the unusual combination of Clarinet, Viola (which Mozart played himself in the first performance) and Fortepiano. Ensemble DeNOTE perform the work using modern reconstructions of a Lotz clarinet and a Walter fortepiano, and a restored eighteenth-century viola. The documentary and performance explore the Trio as an intimate musical ‘conversation’ – an idealised form of chamber music making, in contrast to more typical concert-hall performance. Funding for the project was generously provided by The Institute of Musical Research, School of Advanced Study, University of London, and Canterbury Christ Church University.